Tonight, I got sucked in by Gossip Girl. Not my usual fare, but I sat through all of it–even becoming engaged towards the end. And now, I am going to watch “The War,” because my interests are nothing if not varied. So far, only one student has gotten it right. I think some students don’t even realize I am wearing a costume. I don’t know if you knew this, but 17 year olds are a *little* self-absorbed! 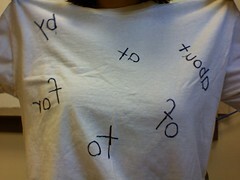 So, here is my costume in all its glory–you kind of have to be able to read backwards to get it. FYI: Scrabble is not the right answer. I buy candy that, during the year, I don’t buy because there are one or more offered flavors that I don’t like. Once I have bought these for Halloween, I then pick out all the flavors I like and keep it for myself, and then hand out those yucky flavors I find odious. It is the PERFECT system. I guess the season is over (sigh), but that does not mean we can’t start preparing for next year. 1. Mini-skirts. I am really opposed to all skirt wearing at a baseball game, but I guess I could see the function in a modest jean skirt on a really hot day. So, I’ll just say mini skirts, because it is a baseball game not a look-at-your-underwear game. 2. Heavy makeup. Personally, I rarely wear makeup–ever, but mainly because I don’t know how to look good in makeup. Still, a baseball game is not the place for your liquid black eyeliner, glittery eye shadow, and foundation so thick you can’t even sweat it off in 3 hours. Try to use a little control–you’re oustide for heaven’s sake. 3. High heels. No, just no. You have to walk from the car to the stadium, there are ramps and stairs and LOTS OF WALKING. Heels are UNACCEPTABLE. 4. Cologne/Perfume. I know that a lot of people like a good scent, but for me the smell of either smelly spray gives me a headache. We’re sitting in close quarters here, no one wants to smell your P-Diddy crap. 5. PINK JERSEYS. Or ANYTHING with the team logo on it in pink. I do not know any major league teams that have pink as a team or uniform color, THEREFORE THERE SHOULD BE NO PINK JERSEYS. If you want to wear pink, fine, but do not sully the team you are pretending to root for with that baby pink barf. Be a real fan, wear the red! (Unless of course it is breast cancer awareness, then I temporarily lift my ban on team-themed pink). 6. A jersey for a team that is not playing at the game you are attending. Hey, we’re at Busch Stadium and the Cardinals are playing the Cubs and you’ve got a Diamondbacks shirt on, WHAT? Save your D-back fan-age for some other day, dude. And those are Nicole’s rules for proper attire at a baseball game. You have been warned. Speaking of Halloween and the Office, this is why The Office is awesome–things that happen in The Office happen in real life. For example, my Dad got an email from the “Celebration Team” at his office telling everyone to dress up for Halloween office trick-or-treating. And can I say, it wasn’t just someone sending an email from the “Celebration Team” there was an actual email address specifically MADE for the Celebration Team. CelebrationTeam@Dad’sbusiness.com. We went to Kansas City this weekend. We did a lot, but relaxed at the same time. Today, I am feeling a bit under the weather–damn hotels–and since NaBloPoMo starts on Thursday, I feel okay in light posting the next few days. 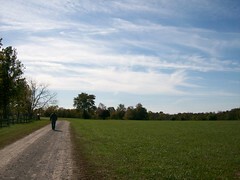 This is a picture taken at Missouri Town 1855 in Lees Summit. I’ll blog all about my love for history –especially living history–some other time. For now, I will just say, R. has decided to make this picture his album cover should he ever decide to go musical. For whatever wonderful reason, I have tomorrow off. Which means R. and me are off on a “mini” vacation. We aren’t going far, but it will be fun to get away nonetheless. It’ll also be a nice break before the insanity of November–what with certification portfolio due, NaBloPoMo, and I’ve decided I’m going to go ahead and throw my hat in the ring with NaNoWriMo too. It’s crazy, and likely I’ll fail at one–let’s just hope that one is not the one with which I need to finish in order to continue with my job!